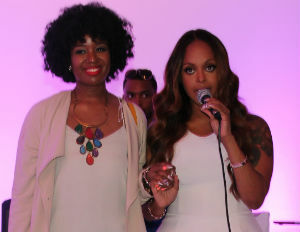 Top beauty and fashion bloggers including AmBrosia Malbrough, Lover4Fashion, and Courtney Adeleye of The Mane Choice, joined Grammy Award winning songtress, Chrisette Michele for theÂ Pose and Post Symposium,Â an 8 city “women’s empowerment & social media marketingâ€ tour. “I created this event for women who believe in positivity. Women who thinks “Positivity Rocks.â€ For women to show each other that we are not in this by ourselves–there are a community of women within our own cities who we can lean on for support. So when you meet someone tonight don’t stop holding their hands,â€ said Michele. Dressed in a stunning, fitted white peplum dress–the self proclaimed flower child and kind rebel, kicked off the night with her latest hits–Super Chris and A Couple of Forevers. As guest indulged in complementary cocktails and sweet treats, a culture of sisterhood and empowerment permeated the brick walled, quaint art studio. The all star power panel dropped gems on following your passion–when no one else supports you, using the power of social media analytics to increase your visibility, turning social media post into profits, and dealing with competition and social media criticism. The panelist even revealed some of their favorite editing apps such as Camera 360 and Facetune. Also on hand to offer support for the stress that comes with building a social media presence was Chrisette Michelle’s Therapist, Nurse Practitioner Gilbert. Black Enterprise caught up with fashion and beauty gurus, Ambrosia Malbrough, Media Maven and Courtney Adeleye, CEO of the Mane Choice; to learn more about the moment they realized they could turn their hobby into a profitable business. “My business definitely fell in my lap and success happened by accident. In 2007, I was a girl with a camera in college who would put on my makeup and just talk into the camera. I didn’t catch on until 2010 that I could turn this into a business. It’s been a long road but I’ve remained consistent to what I love,â€ says Malbrough. As a wife, mother, andÂ CEO of the Mane Choice, a booming hair Solution Company, Adeleye’s primary reasons for joining the Pose and Post tour was to motivate women. “I began my business where most of the attendees who are here tonight started–trying to turn a hobby into a career.â€ I realized I was onto something when I got a call from Essence Magazine to feature “my one productâ€ besides other major brands. I have a staff of 12 right now and for me it’s like having 12 children so this motivates me to keep going,â€ she said. Beyond panelist sharing their personal journey’s & tips for turning their vision into a profitable business, attendees indulged in a little bit of everything–cocktails, selfies, miniature cupcakes, and walked away with a bag full of swag. The Pose and Post Symposium is scheduled to visit Atlanta, GA, Columbia, SC, Philadelphia, PA, Raleigh, NC Richmond, VA and Washington, DC, to learn more go to Rich Hipster.com.